He is very probably the son of Thomas Dinsdale and Rachel Wilkinson, who was baptised on 19 October 1800 in Fewston This is a village in the Forest of Knaresborough between Harrogate and Skipton. Since his own children were also baptised in Fewston, and Thruscross is in that parish, this would seem the more accurate birthplace than Otley. He was the third of nine children and the oldest son. The family lived at West End, a hamlet within the township of Thruscross. His father was a labourer. West End now lies under Thruscross Reservoir. Thruscross was known for its flax mills. CHRISTIANA HADWIN was born in Whitehaven on the Cumbrian coast, c.1809. There is a baptism at St James, Whitehaven, on 8 Jan 1815 for Christian Hadwin, daur of Elizabeth Hadwin. This differs by 5-6 years from the age given for her in censuses. No other possible baptism has been found. One possibility is that Elizabeth did not bring the child to be baptised as a baby. Or Christiana’s baptism may be in the register of a church or chapel which is lost, or has not been digitised. In the 1851 census there is a John Hadwin, also born in Cumberland and living at Horsforth, south of Otley. He is two years younger than Christiana. In 1861 he clarifies that his birthplace was also Whitehaven They may be brother and sister who had moved to Yorkshire together. This was a distance of over 100 miles. John was not brought there by the Industrial Revolution. He was an agricultural labourer. His baptism has not been found either. This strengthens the likelihood that Elizabeth Hadwin is not Christiana’s mother. Christiana moved from Cumberland to North Yorkshire. She was living in Fewston at the time of her marriage. John and Christiane married in Fewston on 19 October 1828. Both bride and groom make their mark. They had six children baptised in Fewston between 1829 and 1842. Isabella, 5 July 1829. They were living at West End and John was a labourer. Thomas, 7 August 1831. They were still at West End, but John was now a weaver. Mary, 28 April 1833. The change was short-lived. John is again a labourer. Jane, born 4 March, bapt 8 March 1835. John is once more a weaver. Sarah, 11 November 1838. Once again John is a labourer. In the 1841 census they are living in Fewston. There are John and Christiana, with their five children: Isabella 11, Thomas 10, Mary 7, Jane 5, and Sarah 2. John, bapt 8 September 1842. They have moved to Hardisty Hill and John is a yarn-drier. Elizabeth, 11 Jan 1846. They are now back at West End. John is again a weaver. Their fourth child, Sarah Dinsdale of West End, was buried in Fewston on 7 Nov 1844, aged six. John and his family moved fifteen miles north to Mickley, a village NW of Ripon, in the mid-1840s (the ‘hungry forties’), when work in the textile mills was scarce. In the 1851 census, John appears as a flax spinning master living in Mickley, aged 52. Christiana, 42, was at home with six children. The four eldest were also employed in the flax industry. Ten years later, they had moved back to Thruscross. Only three of the children are still at home: the oldest, Isabella, and the two youngest. 1861 Census. 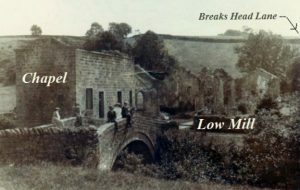 Low Mill, Bridge End, Thruscross, Pateley Bridge, Yorks. The apparent discrepancy in their birthplaces is because Thruscross lay within the district of Otley. John died in the second quarter of 1862. His death was registered in the Patelely Bridge district. He was 62. The following year, their daughter Isabella, of West End, Fewston, married William Grange of Clayton, Bradford, on 16 Feb 1863 in Fewston. Her father’s occupation is given as labourer. Her husband makes his mark, but Isabella signs her name. Christiana moved back to her earlier home in Mickley. Her daughter Mary was living there in 1861. Mary lost her husband Thomas Harland and one of her children in 1865. Both Thomas and Mary had TB. Christiana probably went to live with her daughter some time after John’s death. She died at the age of 56 and was buried in Mickley on 16 Sep 1866. Mary died the following year. BMD and census information from Findmypast.